Since what I mostly make is patches I thought I would post a basic rundown of how I make them, how to apply them, and how to care for them. I use polyester thread and my patches are machine washable and dryable as well as dry cleanable, unless they are made with specialty threads such as solar active or glow in the dark (the blacklight-reactive threads can be ironed and laundered as normal). The polyester thread is bleach safe so if it is a white garment you may put it in the whites load. Oh, and I create my designs with Embird software. To iron my patches on, first take note of the type of fabric you want to put it on (read the label if it is a garment, or look it up online). Some fabrics should not have high heat applied to them, you should not attempt to iron patches to these fabrics. If it is heat-safe, use an iron at high heat (no steam), and apply heat both to the top and backside of the item if possible for 10-20 seconds. If you are at all worried about your iron being dirty, use a presscloth to prevent the patch getting stained or scorched. Let the adhesive cool completely. (Please do not apply high heat to specialty threads though.) The manufacturer of the iron-on backing I use say it may be machine washed and dried, as well as dry-cleaned. A NOTE ABOUT IRON-ON BACKING: If you want my honest opinion, I actually hate iron-on backing. It seals the backs of the patches and makes them look more professional, but I don't trust it to actually hold patches on for long, especially after being laundered. I highly recommend either sewing (when possible) or gluing (when sewing isn't possible) patches on. Use a good fabric cement, E-6000 usually works. Unfortunately there are some fabrics that just won't play nice with any kind of adhesive (canvas and nylon come to mind, so bags/backpacks in general). It seems that the majority of times I get negative reviews on my products is when the customer is dissatisfied with the iron-on backing. It is always my recommendation to sew or glue patches on. It may be easier to do both of these things with no backing present so be sure to order a plain back if you are going to sew or glue. First of all, if you see any faint yellow or blue marks/lines on the fabric, don’t worry! That is just chalk that I use for placement. It will brush or wash right out. I don’t like to prewash items before sending them to customers. Secondly, IF there are NO specialty threads in the design (glow in the dark or solar-active) then you may launder the item as you would normally launder it if it were not embroidered. The polyester thread I use is bleach safe, so if it is embroidery only on a white shirt you may bleach it; but if there is applique (pieces of colored fabric stitched down) present, do not use bleach. You may machine dry as normal, and you may use heat when ironing. If there ARE specialty threads present, please do NOT use bleach, do NOT place in the dryer, and do NOT iron it. You can wash them in the machine but hand washing is recommended. Flat drying is better than hanging as hanging can cause the fabric to stretch if the embroidered area is heavy. If the only special thread is blacklight reactive, you may launder it normally. One more thing, embroidered areas like to curl up in the dryer (again this only applies if there’s no specialty threads). If this happens, just iron it on the backside. My name is Cynthia (or Cyndie), but I have been called Sparky by virtually everyone since high school, when my favorite cartoon character was Megavolt (his nickname, although he didn't like it, was Sparky). I am in my early 40's. I have been crafting and creating my own dolls, toys, and clothing since I was very small. I remember teaching myself how to cross-stitch when I was 8 or 9 and I did all kinds of needlepoint and beading for about 20 years until my sight started to fail. 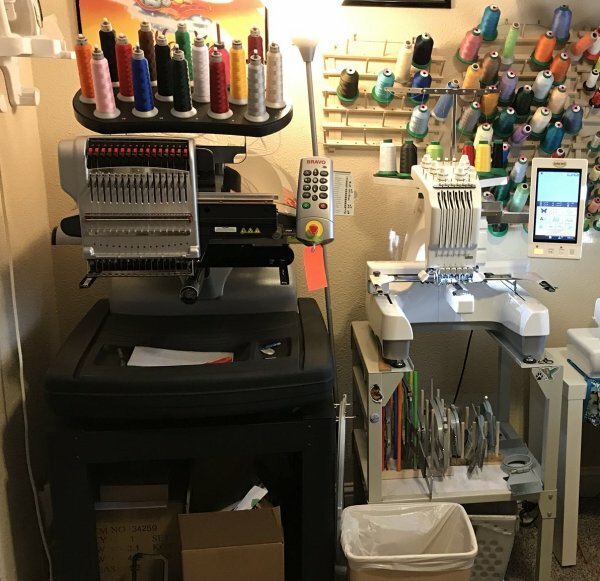 Since I loved embroidered patches and collected them (but almost never actually put them on anything because then they would be ruined) I'd had my eye on embroidery machines for quite some time. Finally my brother offered to buy me a small one so I could start a home business. By a year later I wasn't able to keep up with orders on the small machine so I traded up to a large one. More recently, I have added a larger, commercial machine to the arsenal. I live in the Sacramento CA area with my brother and a pair of noisy finches.